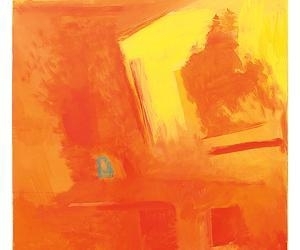 The Spanish-born artist Esteban Vicente, whose career spanned eight decades, seemingly did it all. Arriving in the U.S. in 1936, the artist was part of the first generation of the New York School Abstract Expressionists, held a teaching gig at Black Mountain College, and counted Willem de Kooning as a floor mate at his Tenth Street studio space. Vicente, who is best known for his canvases but experimented with collage as well as small-scale assemblages called divertimentos (toys) made of wood and scrap material, developed a thoughtful, almost peaceful style of abstraction. Keen on deconstructed blocks and rectangles of color, Vicente might very likely have ended up a Cubist if he had been born a bit earlier. His palette, though it varied over the years, is a mix of hot oranges and yellows and cooler blues, grays, and greens—the colors that you don’t see but sense in your eyes when squinting at the sun or the ocean. 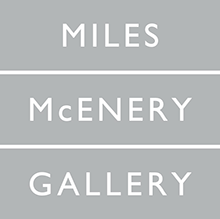 A current show at Ameringer | McEnery | Yohe in New York (through May 21) puts a grouping of later paintings by the artist on view. Inspired heavily by the landscape around Vicente’s home in Bridgehampton, N.Y., the paintings seem to hint at light, water, and land.